﻿ Mortise and tenon woodjoints for furniture and frames, strong wood joinery. Classic timber joinery for furniture making. 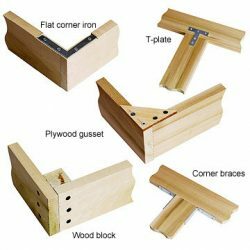 The mortise and tenon is a strong and versatile wood joint, we show on video how to make motises and tenons. Mortise and tenon woodjoints for furniture and frames, strong wood joinery. 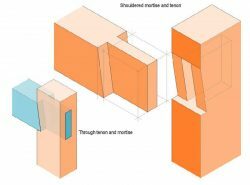 Here we show the most used applications of mortise and tenon in joinery for furniture. Classic joinery in the furniture industry. 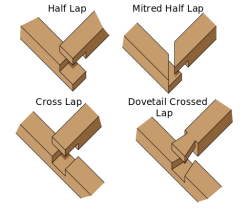 This joinery method has been in use for many centuries. 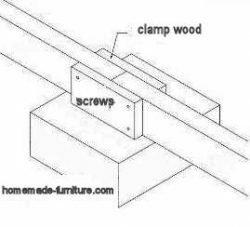 How to make this wood joint is easy, and only a few basic carpentry tools will be needed. Most woodworking plans for homemade furniture will include one or more of these mortise and tenon joints. 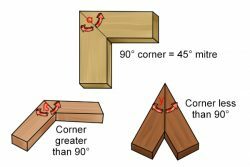 Basic mortise and tenon wood joint. 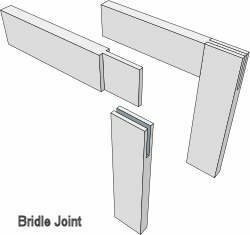 Even though there are many variations for this joinery method, the basics always are the same. 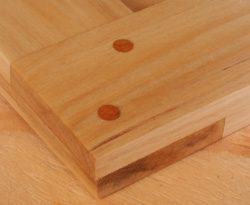 One piece has a hole, that is called the mortise. The other part has a protruding bit like a tongue, that is the tenon. Both parts fit together, the shape is usually rectangular. In that sense it is similar to the dowel connections which are made with round holes and wooden plugs. Mortise and tenon with a shoulder. A shoulder gives extra strength to this joinery method. The shoulders are specially usefull when there is force executed downwards. This can for instance be in the case of table legs or construction of houses with timber. Once you have mastered the technique to make nice mortises and tenons this will the next step. There is hardly any difficulty in this improvement for the joint. The mortise part gets an extra mitered cut and the tenon gets its corresponding material removed. In between the mortise and tenon joint on one side and the dowels on the other is the pointed dowel woodjoint. These pointed dowels are made with a spoke pointer tool. 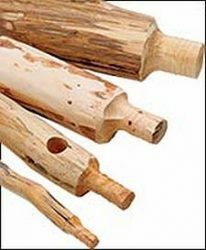 That technique is often used to make farmhouse furniture from logs and spruce. More methods to connect timber. Joinery to make furniture, easy examples for woodworking techniques.